Pirate Jonny's takes traditional BBQ rubs in a whole new direction. The Clearwater, FL company puts a Caribbean spin on it's entire line of gourmet BBQ rubs. 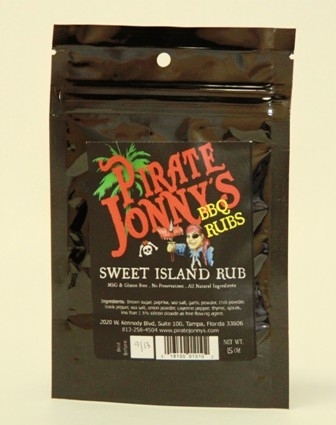 Pirate Jonny's rubs have become favorites of tropical food lovers and traditional BBQ pit masters alike. I recently solicited recommendations for new rubs to try on The "Q" Review's Facebook page. Pirate Johnny's products were among the products suggested most often. Sweet Island Rub is the first Pirate Jonny's product that I've had a chance to use. Sweet Island Rub is available in 1.5 oz pouches, 2.6 oz shakers or 5 oz spice jars. I used the pouch which turned out to be just enough rub for three racks of spare ribs. Though Pirate Jonny's Sweet Island Rub is meant to illicit thoughts of the Caribbean, its ingredients are quite traditional. The rub is a brown sugar and paprika base. The standard base ingredients are enhanced with salt, garlic, chili powder and a variety of spices. The rub is red thanks to the abundance of paprika. It's also incredibly aromatic. The flavor is equal parts sweet and salty. The chili powder and garlic give the rub depth and balance. The salt content is high enough that some caution should be used when using the rub on thinner cuts of meat. However, it's just the type of blend that I love to use on pork and smoked chicken. I used Sweet Island Rub on 3 racks of smoked spare ribs. To stay true to the tropical theme, I paired the rub with a sweet pineapple, mango sauce. The rub was a fine compliment to the smokey pork. On one rack, I applied the rub too heavily resulting in ribs that were a bit too salty. However, when used in moderation, it was very good. It also paired nicely with the sweet, tropical sauce. In addition to ribs, I could see Sweet Island Rub being very good on pork butts and grilled chicken. Though it paired well with a tropical sauce, the ingredients are traditional enough to work with any of your favorite BBQ sauces or glazes. It's also versatile enough to season grilled seafood and vegetables. Pirate Jonny's made an excellent first impression on me with Sweet Island Rub. I can see why their products were so highly recommended. Whether cooking in the deep South or the Caribbean, Sweet Island Rub is a versatile rub that will suit your needs. 1 Response to "Pirate Jonny's Sweet Island Rub"
Thanks for the review Derek. Yes, this is our traditional rub, not meant to be as "Caribbean" in flavor, but instead, we call this the "Family Friendly" rub that kids even like as it is all purpose.